While a United Launch Alliance Delta 4 rocket was being fueled during its countdown to blast off on the West Coast Tuesday afternoon, a mammoth Delta 4-Heavy vehicle was being rolled out to its East Coast pad. The dual operations resulted in a successful launch from Vandenberg Air Force Base in California and delivery on the program's next booster to its Cape Canaveral pad for flight in June. Both missions are giving space-lift power to the U.S. National Reconnaissance Office, the agency that operates the country's fleet of spy satellites. Tuesday's mission, known as NROL-25, placed a new-generation radar-imaging surveillance spacecraft into a retrograde orbit. Read our launch story. After reaching the base of the launch pad around 5 p.m. EDT Tuesday, about two hours before the Vandenberg liftoff took place, the Delta 4-Heavy was anchored onto the hydraulic erector system. The rocket was stood upright Wednesday morning to kick off the pre-flight campaign leading to launch June 28. 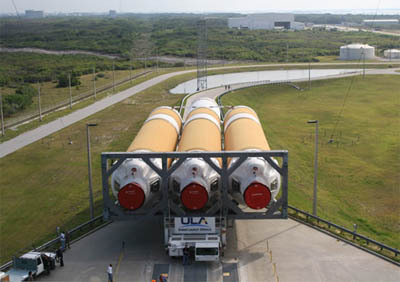 The bright orange and white rocket, triple wide with three stages mounted together for heavy-lifting performance, emerged from the Horizontal Integration Facility around 4 p.m. EDT. Riding a 36-wheel, diesel-powered transporter, the Delta took an hour-long trip down the road and up the pad's ramp to Cape Canaveral's Complex 37. Initial assembly of the rocket, including mating of the three cores and installation of the cryogenic upper stage using a precision laser alignment system, had been completed inside the HIF hangar over the past couple of months. Following completion of the rollout, the pallets cradling the Delta were tied down to the Fixed Pad Erector and the transporter used to drive the rocket to the pad disengaged to pull away. The erector system and its hydraulic pistons then lifted the rocket vertical a little after 10 a.m. EDT Wednesday, setting the vehicle atop the pad's launch table within 20 minutes. Workers later unhooked the booster from the cradles, allowing the erector platform along with the pallets to lower back to the ground. 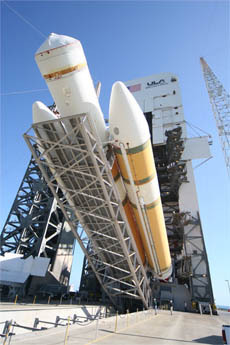 The Delta 4-Heavy will be carrying another classified payload for the National Reconnaissance Office. The mission is known as NROL-15. It will mark the debut launch of the upgraded RS-68A main engines on the three booster cores. Built by Pratt & Whitney Rocketdyne, each hydrogen-fueled powerplant will deliver 702,000 pounds of liftoff thrust, an increase of 39,000 pounds over the current RS-68 engines successfully flown 29 times to date. Generating 2.2 million pounds of Earth-shaking thrust, the Heavy will be flying for the sixth time in history and the Delta 4 program will be achieving its 20th mission to date.